Weight : 43 lbs. needs to add a few lbs. A wonderful volunteer found Aeolus (the Greek God of the Wind) abandoned at a forest area near Istanbul, Turkey. He was very scared and skinny. Our A & B rescue with cooperation from the international rescue team flew him to Atlanta. Our dedicated members cared for him and arranged transportation to his foster dad. Socialization/training: Aeolus is very social and loves to be with people. He enjoys his walks with other dogs. He usually observes the situation at first and takes guides from his foster sister before rushing to say hello. Children: He doesn’t have any children in his foster home but is happy to greet children on our morning walks. He does tend to get excited as he meets new people so we need to approach slowly and prevent a small child from getting not down in the excitement. Dogs and Cats: He loves to be and play with other dogs. We don’t suggest he is adopted by a family with a cat. 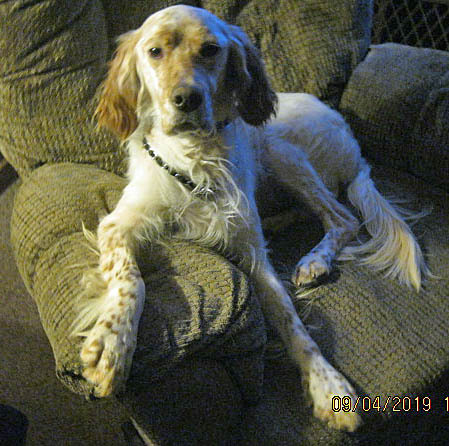 House training /manners: He has been perfect during his time with us; he seems to have the setter switch- run and play outside but comes in and the switch turns to excellent manner. However, warning when food is on the table he needs to learn that it is not out for him. Crate: The crate is not his favorite place. At bed time he enters with a treat and calms down in a short time. He is all excited to get out first thing in the morning. I’m sure in time he could have the run of the home at night. Leash training and fence: We are working on our leash training and he improves every day. He’ll start pulling early but takes correction with no problems. A home with a fenced area would be perfect for him. His first several times in the fenced area he didn’t what his foster dad to leave and was not happy until dad returned. 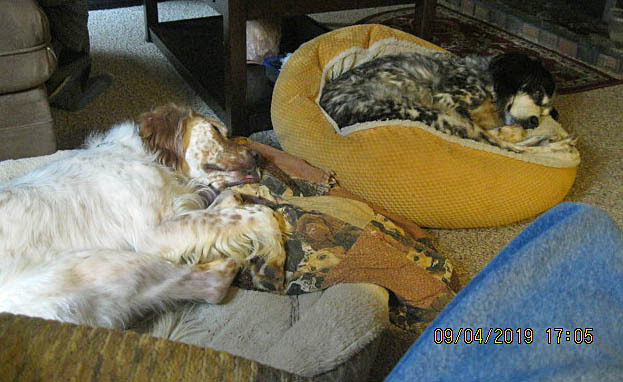 He demonstrates a beautiful setter grace and prance at slower speeds when he has company. If given the chance with a 30’ lead he has great speed. We estimate that he has medium to high energy. Medical History: Aeolus is current on all vaccines and tests. We will be maintained on Heartworm prevent and is neutered. His chip # is on his medical report. Because he is from Turkey where Leishmaniasis is endemic he was tested negative, but the parasite can remain dormant in the system. Potential adopters must be willing to commit to annual testing for the next 7 years. Your vet can draw the blood and send it to a lab. The test typically costs $120-150 but varies from vet to vet. Foster Comments: When Aeolus was with me for only a few days and I was able to watch him with other people and dogs I remembered a section from a 1972 book. The New Complete English Setter by Davis Tuck. 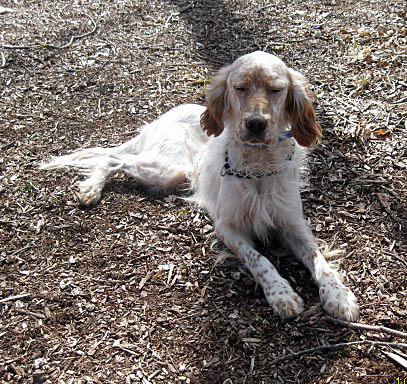 “The mild sweet disposition characteristic of the English Setter, together with its beauty, intelligence and aristocratic appearance in the field and in the home, has endeared it both to sportsmen and to all lovers of a beautiful, active, rugged dog. Their lovable disposition makes them ideal companions for children”. D. Tuck must have had Aeolus in mind when he wrote this section. 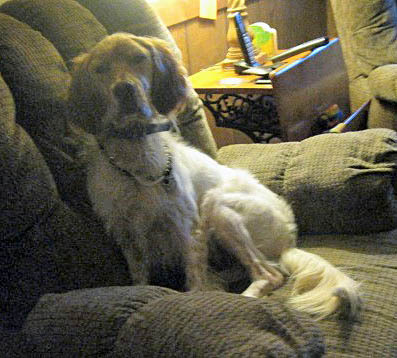 I believe our A & B Rescue will receive many great comments concerning this setter over the next few years. 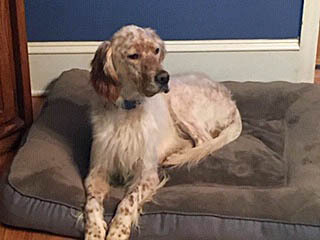 Short BIO for Aeolus: The lucky family who adopts this super setter should tell their friends that they won the lottery.